Supervisor Don Knabe delivered his annual state of Los Angeles County to a capacity crowd at a luncheon at the Long Beach Convention Center today, hosted by the Long Beach Area Chamber of Commerce. In his fifth annual address, Supervisor Knabe called for more focus on supporting businesses, creating jobs and reforming programs. With the County’s caseloads for programs and services at an all-time high, he encouraged public/private partnerships to put people back to work. 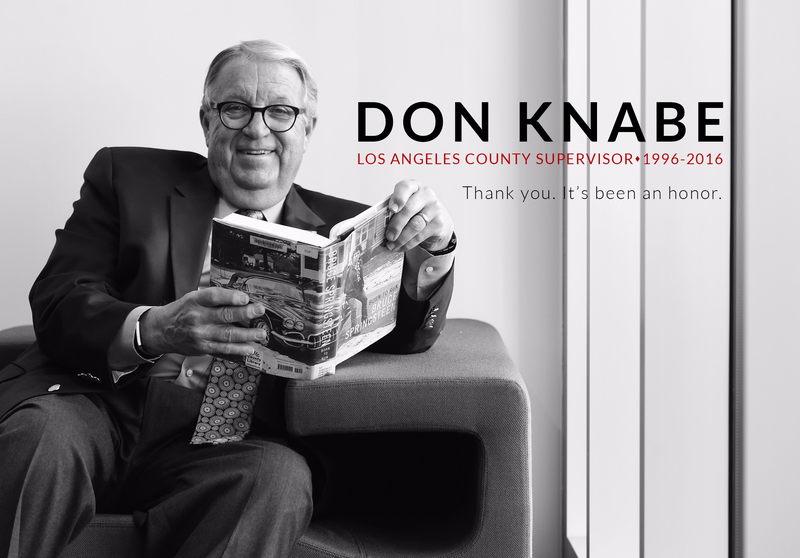 The full speech is available onlineand can be watched on Supervisor Knabe’s YouTube Channel. Supervisor Don Knabe will be addressing the state of Los Angeles County and the Fourth District at a luncheon at the Long Beach Convention Center on Thursday December 8, 2011 at 11:30am, hosted by the Long Beach Area Chamber of Commerce. In his fifth annual address, Supervisor Knabe will speak about the ongoing challenges of the global economic crisis and the impact of the state budget on Los Angeles County. With the County’s caseloads for programs and services at an all-time high, he will discuss how the public and private sectors must join together to put people back to work. Constituents can view a live streaming broadcast of the “State of the County” address through Facebook by going to http://www.facebook.com/supervisorknabe and clicking the play button. Utilizing this feature will allow anyone to view the broadcast as well as allow them to chat with other viewers about the topics addressed in the Supervisor’s speech. County employees interested in viewing the broadcast can watch it by visiting http://www.ustream.tv/channel/ask-don-live1. Any organization wishing to simulcast Supervisor Knabe’s address can embed the video stream from the link as well. A motion by Supervisor Don Knabe on the Tuesday, October 18, 2011 agenda for the Los Angeles County Board of Supervisors calls for specific recommendations for restructuring the County’s General Relief (GR) program to reduce fraud and direct resources to those most in need. The motion comes as the County has seen its caseload nearly double since January 2007. General Relief is a state-mandated program that requires counties to provide assistance to indigent adults who do not qualify for other benefits. Los Angeles County accounts for nearly 70 percent of the total statewide population receiving benefits. In 2010 and 2011, on motions from Supervisor Knabe, the County began restructuring the GR program, with a focus on strengthening efforts to assist GR participants with accessing one of the two paths off of the program – employment or disability. During the review process, it was learned that nearly one-third of the assistance payments were being made to individuals who were not pursuing either path, requirements for participation in the program. Earlier this year, the County’s Chief Executive Office and Department of Public Social Services developed a menu of options to reduce costs for administering the GR program, including verification of residency, increased case management and strengthening the sanction policy when GR participants refuse or fail to comply with program requirements. Knabe called for further assessment of these options and am implementation plan. In a unanimous vote, the Los Angeles County Board of Supervisors Tuesday called for the Los Angeles County Auditor-Controller to audit the Los Angeles Memorial Coliseum Commission and, if necessary, to serve as the interim chief financial officer of the commission. The vote, on a motion sponsored by Supervisors Don Knabe and Mark Ridley-Thomas, came after numerous allegations of financial mismanagement at the facility. “We need to mobilize any and all resources to maintain the long-term financial stability of the Coliseum,” said Supervisor Knabe, who also serves as the Vice President of the Coliseum Commission. “A thorough and complete audit will ensure that we get the Coliseum back on track and honor its history and the important role it will continue to play in the Los Angeles region,” he continued. The motion would authorize the Auditor-Controller to play a temporary role at the Coliseum, but only if requested. Since 1945, Los Angeles County has participated in the management of the Coliseum with the City of Los Angeles and the State of California through the Joint Exercise of Powers Act. The Joint Powers Act specifies the books of the Commission shall be open to the city, county and state partners. “Over the last week, there has been considerable media attention on the County’s beach facilities, in response to the suggestion at the last Board Meeting that there are issues with the cleanliness of our restrooms that could lead to a health crisis. In fact, a review of the Department of Beaches and Harbors’ complaint log shows that no calls had come in regarding restroom cleanliness at our beaches. Rather, patrons were frustrated that the restrooms were not open early enough, a schedule change that had been made over the last month due to severe budget cuts. Restrooms to Open by 7:00a.m. In an effort to honor the members of the United States Armed Forces who served in the Vietnam War, Supervisor Don Knabe has proclaimed March 30, 2011 as “Welcome Home Vietnam Veterans Day” in Los Angeles County. For decades, efforts have been made to properly recognize the sacrifices of those who served the United States in Vietnam. In 2009, the State of California officially signed into law AB717, which declared March 30th as “Welcome Home Vietnam Veterans Day,” in large part due to the tireless advocacy of Jose Ramos on behalf of his fellow Vietnam vets. Congresswoman Linda T. Sanchez, a long-time supporter, has also introduced HR 184 in hopes that this day will be declared at a national level. In Supervisor Knabe’s Board Motion, he noted that more than 2.7 million Americans served during the Vietnam conflict, with more than 58,000 United States soldiers sacrificing their lives, and more than 300,000 wounded. On March 30, 1973, the United States Armed Forces completed the withdrawal of combat troops. Upon their return home, Vietnam vets were met with mixed emotions and were never adequately honored for their service to our country. The Los Angeles County Board of Supervisors approved a joint motion by Supervisors Don Knabe and Mark Ridley-Thomas to pursue a State Constitutional Amendment to secure adequate and permanent funding for any services the State moves under local control. As part of the State’s efforts to manage its $26 billion budget shortfall, the Governor has proposed shifting responsibilities for certain programs and services to counties and local jurisdictions. A guarantee that if the State does not provide counties with revenue for realigned programs for the sixth year and beyond that is consistent with item b above, counties would be authorized to withhold that amount in property tax revenues. Supervisor Don Knabe will be addressing the state of Los Angeles County and the Fourth District at a luncheon at the Long Beach Convention Center on Wednesday December 8, 2010 at 12:00pm, hosted by the Long Beach Area Chamber of Commerce. In his fourth annual address, Supervisor Knabe will speak about the impact of the current economic situation on the County, and programs and projects he is launching to bring jobs to the region. As Chair of Metro, he will also provide a status update on transport projects underway across Los Angeles. Yesterday, the Board of Supervisors approved a ban on Medical Marijuana dispensaries in the unincorporated areas of Los Angeles County. The ban was passed with a 4-1 vote and is scheduled to be formally adopted on December 7th. If adopted, the ordinance would go into effect 30 days later. Los Angeles County will convene a taskforce to report back in 90 days with recommendations of how to facilitate the co-existence of both mobile food vendors and restaurant owners, Supervisor Don Knabe announced today. Restaurants have raised concerns that mobile food trucks and food cart vendors are unfairly competing with them. Some vendors park in front of restaurants and draw customers away from them. Mobile food operators often do not pay for parking, rental space, property tax, and hire fewer employees. With lower overhead costs, they are able to offer cheaper prices as well. The taskforce will include representation from the Southern California Mobile Food Vending Truck Association, the Restaurant Association, the Department of Public Health, the Small Business Commission and other interested parties.